Melasti continues to provide good value for location . Property / rooms are a bit tired but adequate . Improvements have taken place since last stay and understand further room improvements are to be carried out. Only criticism is the wi fi - really needs an upgrade !!!! Get location beach property close to restuarants bar. Rooms were big and comfortable bathroom was ok except for the shower and the pressure 4of the water. I was a bit hesitant about coming to Bali for the first time - but the Melasti was a fantastic place to stay. We had a suite cottage - very spacious and clean. Our cleaner was very friendly and gave us extra towels and water when requested. Breakfast wasn't flashy but fine - egg station, toast, mini pastries, some cereal and a different hot option every morning. The big pool had a lot of families so we chose to swim in the quieter pool by the lobby. Thoroughly enjoyed it, would recommend it and stay there again. Main pool and facilities in rooms need attention. TV reception in room was poor, internet was next to useless, rooms especially bathrooms starting to look tired. Main pool was fun for the kids but is also looking tired. Breakfast was basic. We had a great stay at the melasti resort, it a little tired however room are nice, clean and large. Breakfast is nothing to rave about and can use a little more variety. We would definitely return as the location is perfect especially if you love the beach. After many stays at the Melasti they did accommodate us with rooms as requested. Room was fine. Toilet blocked and shower was small but for the price was great. Staff were always helpful and friendly. We had a wonderful stay it was very central to everything and the service was impeccable. A bit thankyou to our room cleaner kettut on level 3 he had amazing customer service. Needs some work done to property but great value for money. Great location. Clean rooms. Nice staff. The hotel is old and has several maintenance issues such as loose locks and blown light bulbs but despite all this it is still my favourite hotel to stay in bali. Always love staying at the melasti beach in legian - its a great location and the hotel is great. the staff are friendly and the rooms always clean and great value for money due to the size of the room. we always stay in a deluxe room. Close to everything. This made finding good food easy to find. The restaurant in the hotel offered a good mix of options and offering 24/7 room service. The breakfast is an all you can eat with them making eggs your way to order. Not a huge selection but a good variety that changed from day to day. As always the staff are always willing to help. The aircon in the hotel worked wonderfully. There was three pools for us to access. All different, two having bars attached. Easy way to watch the kids and unwind at the same time. Prices for everything weren't bad. They offer a variety of rooms and sizes. Our stay was terrific, would definitely stay there again in the newly renovated rooms by the pool. On our first night we stayed in an older room and on the first floor, which was ok they did upgraded us. We had requested the newly renovated rooms, ground floor and by the pool months ago. There was one available the next day so they moved us. The room was lovely. The following day they moved the rest of my family to the same rooms, which made it a lot easier with the grandchildren. They thoroughly enjoyed it and want to go back again. Location is great, very close to all the good shopping and a short walk from the best restaurants and night life of seminyak. But I would have to say that the rooms and pools are a bit run down and in desperate need of attention. We were initially put in a superior room just past reception and by the pool but this was of substandard and similar to rooms I have stayed in India, you can imagine what I found. An upgrade to a deluxe was much better but if I went again I would definitely stay somewhere else. Sorry to say but I feel it's important to be honest. Hotel is undergoing long overdue renovation. Superior room was vey spacious but very run down. Breakfast was below average however room service food was fine. Stayed here many times before - great site, great rooms, great location, love that you can eat a leisurely buffet breakfast overlooking the beach. Staff are so very friendly, welcoming and accommodating. Great for couples or families. We will always look to stay here in Bali as a first option. We've stayed at the melasti around 6 times, love the location but the cottage suites desperately need work/maintenance/upgrading. The past few years we have said that we would try different accommodation next year, due to the maintenance issues but next year unless something drastically changes we will.be looking elsewhere. There is basically something wrong with every suite, whether it be poor aircon, water leaks, mosquitos due to gaping holes in fly wire.....the suites desperately need some maintenance! Nothing was a drama for the staff. Everything was clean. The 3 pools well used. Breakfast daily awsome. Its our second stay melasti and it wont be our last. Melasti is undergoing long overdue renovations. This is our third stay at the Melastii the staff are outstanding special mention to our room boy Ketut outstanding service. It is not five star but does offer outstanding value in a great location would recommend to all. We had a very pleasant stay at Melasti. Booked a superior room but on arrival it was twin beds and we had booked double so they offered us a suite at an extra charge of course. Whilst talking to other people by the pool this is a common accurance so just bear that in mind it blew our budget for the holiday. Having said that location is excellent, staff are excellent we enjoyed the breakfast overlooking the beach each morning and the suite was large and comfortable. Renovations by the pool quite noisy with jackhammers etc but overall stay was good. The Melasti is good value at a great location. The Melasti is an older hotel showing signs of wear and tear. However, the rooms are clean and large and are serviced daily. Overall service was excellent with friendly staff. Great location if you like the busyness of Bali. Right on the beach and a short walk to shops, restaurants and bars. We would stay there again. had a great week at melasti. great staff and great stay..
Our party ranged from elderly to young and everyone enjoyed their stay. The staff were friendly and helpful. The location was great close to shopping, restaurants and the beach. We would all stay there again. Have nothing but praise of the highest kind overall was just perfect, service was fantastic, the location could not be in a more perfect position, the staff from management to room boys, cooks, drivers, breakfast staff, pool boys, all very pleasant and ready to help in any way they could, if I have forgotten anybody I am sorry, because anyone I came in contact with were just well mannered and willing to help, I would recommend this resort to anyone traveling to Bali, it will make your holiday worthwhile and enjoyable, hassle free vacation just what we all need. Well done and thank you. Stayed at Melasti Beach Resort numerous times over 10 yr period, rooms are tired and ideally need refurbishing, however clean and tidy. Staff and service has always been friendly and attentive grounds beautiful. Great value for money. One of the few remaining affordable resorts for families on the beach front. Excellent value 4 money & also excellent location. Will stay there again. Cheers & many thanks. Joe & Vivienne Berto. Melasti very good hotel and great staff and location, on the beach and close to everything. Had a great time, stayed in a cottage suite which was lovely, Breaky was basic but ok, pools were lovely, beautiful gardens, cant really fault anything, overall we had a lovely stay and would definitely stay again, cheap accomodation and would rate a 4 star :). Fantastic place to stay. Great staff who assisted with any enquiry. Pleasurable place and will return. I really loved this resort after hearing a couple of negative comments I was pleasantly surprised its was everything I wanted and a little bit more. We had a fantastic time and our room attendant Ketut was great. Looked after us very well. We enjoyed our time at Melasti Beach Resort, staff were friendly and helpful. Our room was freshly renovated and was fantastic, cottage suites are huge. Breakfast was basic but what you would expect for the price. Kids and I had a wonderful time. Great stay again. if you are looking for 5 star, its not. it is a great place for families, staff all friendly, 90% aussies , overall had a ball. 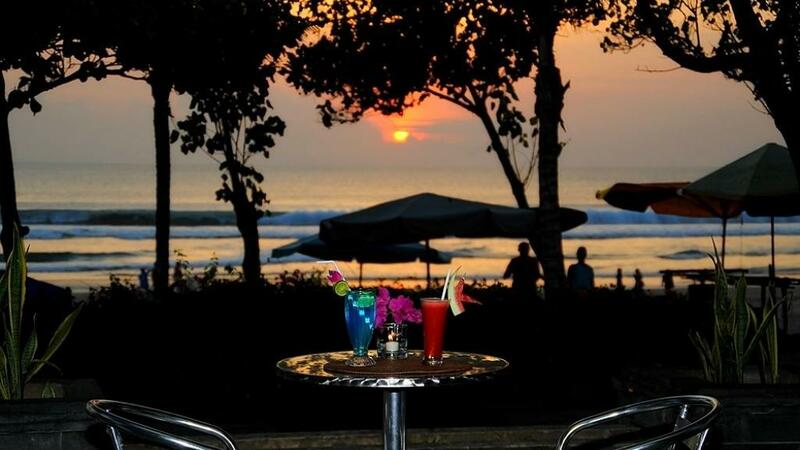 The Melasti Hotel in Legian offers a great Bali venue to stay. It is getting a little old and some renovation is necessary (we had trouble with the room safe and the air con was average) but overall it offers a more traditional Bali stay at a good price (unlike some of the more recent accommodation that is pretty much the same whether you're in Bali or Sydney or LA - boring). The hotel grounds, pools and location are superb and as always the staff go above and beyond to make your stay enjoyable. I went with 3 children (13, 10, and 8) and they loved it. Depending on what you want from your accommodation, I would not hesitate in recommending the Melasti Hotel to families. Legian is also so much more relaxed then the chaos of Kuta. A Little tired and parts do need some TLC. Place needs new pool furniture and more towels. Breakfast has some very odd combinations and not very western when you look at the amount of Australians staying. Some smoking restrictions would be nice I think we were the only non smokers. Having mentioned a few negatives if you look at what you are paying it represents very good value for money. We had a room change due to plumbing probs straight away! Room boys very obliging! Suggestions: Darker curtains in room, maybe the pool in the block section adults only and a non smoking side in the block section. Overall, a good stay! Excellent value. Good position. Comfortable accommodation . Professional Lobby staff. I am friends with the staff now as I always stay here and wouldnt feel comfortable anywhere else. This hotel is nothing flash but has a great pool, that has a shallow area for kids. Great location within walking distance of kuta and seminyak. Staff were super friendly and very efficient . The room (Superiour) was excellent size but the bed could have been a bit more comfortable. The room staff could not do enough for us. Room was always clean, water supplied and extra provided when requested. Great location and all staff eveywhere where friendly and helpful. had a great time people are great food & beer all good meat new people , staff and hotel great , we will be coming back. Rooms decorated in Bali tradition need updating to compete with the many new properties being constructed. Breakfast was very good, all food was very good and reasonable price. we will definitely be returning to the melasti. all our needs were met. no problems encountered. A reasonably priced hotel in a great location it is being slowly upgraded which is a good thing. I've been a regular at the Melasti for 13yrs it's a little out dated now but over the last few years they have been doing it up. Location is good for the beach, shopping and restaurants. Rooms are a good size and the staff are great. A very pleasant affordable place to stay in Bali. Staff were very friendly and willing to assist. Choice pools and food offerings were great. The Melasti Beach Resort was great. It is an older style resort which makes you feel like your holidaying in Bali and not anywhere else in the world like some of these newer resorts. The resorts location was good, positioned right on the beach close to restaurants, bars, shops and markets. The hotel had a great atmosphere, the staff really friendly and helpfull and my 4 year old son loved the three swimming pools. It was a very relaxing place to stay, very quiet at night time, which was good for us with young children. I would defiantly recommend the Melasti Beach Resort and the cottage suites and are very happy with the service we received from Travelonline. Thankyou very much and we will speak to you soon. Melasti is awesome place to stay, staff are extremely friendly and helpful. Directly opposite the beach, playground for kids near restaurant and entertainment nightly. The Melasti Beach Resort is comfortable, clean and value for money, remembering that it is a 3 star resort. The location is it's best asset as we love sitting on the beach at sunset. 2nd time back there and would keep going there. They have started renovating the hotel and what they have done looks really good but the service is great the staff are really friendly and it's traditional bali. it's what we go to bali for. LOVED THE TWO LARGE SWIMMING POOLS AND LOVELY GARDENS . We recently stayed at the Melasti Beach Hotel, we found it great value for families on a budget. We stayed in a cottage suite room towards the beach, they were very spacious and its great because you pay per room not per person. The suites sleeps up to five people. Even though they were older they were very clean.The location is excellent, beachfront and close to great resturants and shopping. The free Wi-Fi was great for our teens. The staff are some of the nicest, sincere people I have encountered in my many trips to Bali. The 3 pools are well maintained but are deep. The only downside was the renovations to the beachfront restaurant. They provided a great breakfast in the ballroom. Will be great when they reopen the restaurant. In my opinion this is a fantastic value for money resort for families on a budget, even though it is older than most it has everything you need, I will definetely be staying here again as we had a fantastic time. Well done Melasti..
Central position. Efficient staff. Good amenities. Deluxe room great. Bed very comfy. Pillows great.Would recommend. 2nd time visitor. I thought it was in a good location for us, rooms were a bit old but suited us fine. We found that this hotel was good value for the money that we paid. Very family friendly. The resort itself is due for a little update and some of that was in progress when we visited. The location on the beach is excellent and the gardens are beautiful. The staff and service is what makes this resort shine. They are very attentive and caring and great with the kids. Stayed at the Melasti several times and again not disappointed . Improvements gradually being completed ,staff always friendly and courteous . Our stay was good.the staff were very polite and helpful. The breakfast was average and could have been better. The rooms were basic, but for a three and half star they served their purpose . The large pool was being updated which should have been completed. Overall I would go back there as it was cheap and close to the. Main show and restaurants. The hotel didnt have great reviews, but l would definately stay there nex time. My partner and I are in our early 20's and we had a terrific time at the Melasti Beach & Spa Resort. The staff were very friendly and I would recommend anyone to stay there. Travelonline is a great company.. Unfortunately the main pool has construction going on..new bar and the pool itself will be renovated so the other pool was crowded.this will continue for a while so I would let people know..your site only mentioned the tennis charts being out of action. On a positive note the free massages were awesome..the spa at where I had the massages was top of the range..very impressed..I will book through you guys again . Hotel needs to buy new towels. Breakfast needs improving. Sixth time. Have stayed here and do so mainly for location. Great value for your money !! Great location, rooms clean and have everything you require, overall the rooms/resort could do with a make over, but great value for what you pay. Breakfast great, especially the pancakes and does have a few daily changes. We were there for two weeks and would definitely stay there again! The hotel is getting a little old but on a whole the rooms are clean, spacious and comfortable. The location is fantastic and the staff are friendly and helpful. I have stayed at Melasti Beach Resort on 6 previous occasions and will continue to stay in the future. Excellent location to shops ,restuarants an the beach.Great value for money, would i stay there again Yes! Overall very good. location was in the heart of Legian, at a great price. Disappointing the large pool was being renovated, as that meant the medium pool was crowded. Also, better control over the schoolies by the staff could have been shown. Breakfast was only if you had to. Edible but very high carb and fat content. Having said that, I would stay again. For what it costs, it was great. Everybody was very polite, welcoming and i would defiantly stay there again! This Property is no good for anyone with a disability.I have a bad knee, and around the property are alot of uneven paver's. A fair walk to the breakfast room, and the road that the Melasti faces onto is a nightmare to walk around. It is located on a sharp bend, scooters scream around, I had alot of trouble trying to cross the road because I could not always walk fast enough due to my knee injury. The foot paths are very steep, narrow and have bits of metal (Loops) on them. The island shaped pool was closed for five days due to algae problems. This pool was hard to get into and out of with a sore knee because there are is no hand- rails and the steps are steep. The rooms were fine, paving around the pool is very uneven and tiles missing from the pool, breakfast is ok, if the owners just spent a little money around the pool areas if would be better. I wouldnt stay again. The resort is a little run down and needs updating but for the price and location you can't go past it. After just coming home from our 2nd stay here I would highly recommend the melasti. Although the rooms need a bit of tlc they are clean and the resort is beautifully cared for. Friendly staff, great dining, great pool. Will definetely book in there again next year.